It's the time of year (combined with my twice-a day-walk by ACKC) that's got me craving hot cocoa. I'd like it in a big mug, accompanied by A Christmas Story or Emmett Otter's Jug-Band Christmas. The Swiss Miss variety will do, but a cup made from my neighbor's recipe, topped off with fluffy marshmallows, would certainly be preferred. Making hot cocoa is simple and quick, but making those fluffy marshmallows takes a little more preparation. 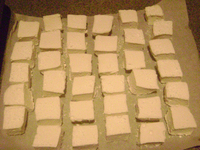 You can buy marshmallows – a variety of colors, shapes and sizes are available in bags just about anywhere – but homemade marshmallows provide a spongier, creamier texture with a more complex taste. And maybe you're laughing at my description of marshmallow flavor as "complex", but trust me. Homemade marshmallows are nothing to laugh at. Especially when there's rum involved. NOW I have your attention. You can add any flavor to marshmallows, including chocolate, cinnamon or coconut, but since my marshmallows are going straight into a cup of hot cocoa, I can think of no better flavor than rum to spice up that cup. Fold a piece of parchment paper until it fits snugly into the bottom of the pan you'll be using. I used a 7 by 11 inch pan, but other variations should work (just make sure you have at least 1 1/2 inches in depth). Let the edges of the paper drape over the edges of the pan on 2 sides (see picture). Generously sieve the bottom of the pan with confectioner's sugar. Pour the rum extract and 3/4 of the cup of water into a mixer bowl and sprinkle it with the gelatin. Stir with a fork, and let stand while you complete the next step. Combine the remaining 1/4 cup of water, the granulated sugar, corn syrup and salt in a sauce pan and cook on medium heat until the sugar dissolves. Raise the heat to high, and let the mixture boil until it reaches 250 degrees. Remove the syrup from the heat. Begin mixing the bowl of softened gelatin with your stand mixer (on a low speed) and slowly pour the syrup mixture in. Raise the speed of the mixer to medium, and beat for 2 minutes. Then raise the speed of the mixer to high, and beat for 10 to 15 minutes, or until the mixture is solid white in color and very thick in texture. Spread the mixture into the prepared pan. Sieve a layer of confectioner's sugar on top, and let the mixture stand, uncovered, over night so the marshmallow can set. To remove the marshmallow from the pan, take a knife and slide it along the edges of the pan that are not covered with parchment paper. You can use a little confectioners sugar on the knife if need be. 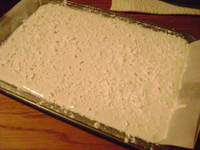 Remove the marshmallow, in a block from the pan and place it on a counter top, covered lightly in confectioner's sugar. Using a pizza slicer (with a round blade), cut strips of marshmallow to your desired thickness. Then cut the strips into blocks. Toss these blocks in a bowl of confectioner's sugar, and then lay them on a piece of parchment paper to dry for 1 1/2 hours. Store your finished marshmallows in an air tight container in a cool, dry place. They should last up to 3 weeks. Where might one find rum extract? And is it possible to use the same recipe minus the rum flavoring, for a plain-old marshmallow, or substitute vanilla extract? ArsBars, you should be able to find rum extract or imitation rum extract at most major grocery stores. Drew is correct, I found extract at Harris Teeter. Also,you can substitute the rum extract with vanilla extract. Use the same amount. Can you just use rum? Interesting question. I think you could use rum, but you'd have to use a very small amount, as to not throw off the amount of liquid in the mix.